We offer free tailoring on all suits. Having 35 years of experience, we pride ourselves on our high quality, unmatched workmanship. It’s our job to make sure our customers look good. And, we can keep your measurements on file for future reference and personal shopping. Our philosophy: we offer up to 50% off the national retail price of designer clothing. With these prices, you’ll never have to wait for a sale. We carry many well-known brands: Calvin Klein (White Label), Ralph Lauren, Hugo Boss and Zanetti. 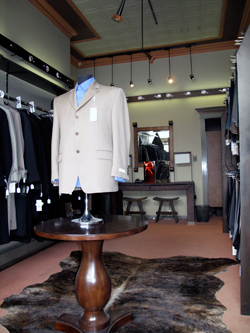 In 1973 Get Dressed was established as a fine menswear establishment in the heart of Buffalo. Our goal then, as it is now, has been to carry the very latest and finest in men’s fashion, at affordable prices. We have been an Elmwood district mainstay since then. Our personal service and free alterations – the only free alterations of men’s clothing in the City of Buffalo we believe – has made us a consistent shopping stop for families and men for over three decades. Young professionals who have left the area, make Get Dressed a priority stop when home because the value of our merchandise cannot be found in other cities – large or small. Get Dressed is the perfect place, conveniently located on the Elmwood strip, for a new suit, shirt or wardrobe for the season. Or just when you need a pick-me-up. © 2010 Get Dressed. All Rights Reserved.